David Eun, presently serving as EVP at Samsung's Open Innovation Center after stints at AOL, Google, Time Warner and NBC Entertainment, just took the stage here in Dana Point, California during the opening night of D:Dive Into Media 2013. Given the media / content focus of the event, the conversation between Eun and host Kara Swisher revolved almost entirely around Samsung's role in the world of content, production, connectedness and distribution. Starting things off with a bang, he affirmed that Samsung is opening two new Innovation Centers that'll act as idea accelerators. In a way, this is Samsung getting into the funding game, which certainly adds a new twist to an industry that has largely been dominated by angels that aren't necessarily a part of a major corporation. Initially, one will be opening up in the Bay Area, while the other gets planted at an undisclosed location in New York City. Eun noted that in the past, Samsung was "focused on manufacturing hardware," but it realized some time ago that you "have to get both hardware and software right." He stated that the company as a whole has been "investing quite significantly over the past few years on software," and turning to how it impacts content, he explained an internal company process that aims to gather insight about consumers. Not necessarily in the creepy, privacy-invading kind of insight, but in the way of discovering what consumers want, but don't yet have in the marketplace. Eun noted that Samsung is "creating more and more devices that have displays," but stated that there was a huge, untapped potential in this. 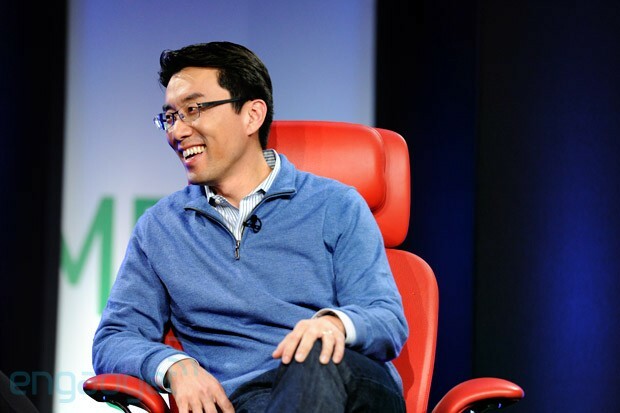 According to him: "Once [Samsung] connects these devices, we'll have one of the largest platforms for distributing apps -- maybe even ads -- in the world. That is one of our goals." Swisher then asked him if Samsung would be interested in crafting its own advertising network, but he backed away from confirming if the company would go out on its own rather than working with partners. If you'll recall, Facebook found this very same chore far more daunting than it perhaps looked at first blush. Of course, an interview with a Samsung executive wouldn't be an interview with a Samsung executive without a mention of Apple, and amazingly, Eun opened up just a little. Speaking more as a fan of technology than an employee of Samsung, he called the ongoing patent battle between Apple and Samsung "a loss" for innovation. As a segue from there, Eun noted that Samsung is making concerted efforts to make its products work together with devices and services outside of Samsung -- in other words, it's unrealistic to assume that each consumer owns a Galaxy Note 10.1, a Galaxy S III and a Samsung HDTV. As his own pitch internally, he's toiling to create products that "just work," regardless of what other products are in the mix. It's an interesting view, and an unbelievably intimidating challenge, but it makes us wonder if there are any ongoing discussions behind the scenes regarding standards and protocols as it relates to content and media distribution. He also dropped a brief mention of upcoming "innovation" in terms of Samsung gear, affirming that its smartphones are perhaps the most important at the moment. Nah, it's not a confirmation that a Galaxy S IV is en route, but it's definitely confirmation that the company has a whole lot riding on whatever it is. We'll be reporting live from D:Dive Into Media as it continues on February 11-12. You can follow our coverage by using the "dmedia2013" tag.